Why do I have to take levodopa so frequently? Short answer: Once levodopa gets into your bloodstream (after being absorbed in your digestive tract), it doesn’t last long … most of it is gone after about 2-3 hours, and then you need to take more. The resulting rapid oscillations in blood levels of the drug are responsible for both on-off cycling and dyskinesia. Longer answer: All drugs get cleared out of your body on some timescale. That’s largely a good thing; your body is well-designed to get rid of ‘foreign’ compounds, through a combination of chemically modifying the drugs (often in the liver) and then eliminating them through the urine or the bile, for example. The study of these types of processes is called ‘pharmacokinetics’. That, in a nutshell, is the Achilles’ heel of levodopa. Not all drugs have such a short half life. For example, bupropion (Wellbutrin), a common anti-depressant, has a half-life of 21 hours. That’s great, because once-a-day dosing becomes possible. No such luck with levodopa. There are (at least) 4 strategies to combat this problem. Reduce the rate at which the drug is eliminated. Actually, sinemet and stalevo, the two most common drugs containing levodopa, already do this. They both also contain a second drug, carbidopa, which reduces the rate at which levodopa is degraded outside your brain. There are also drugs to inhibit two key enzymes, discussed here, that wind up degrading the dopamine that is produced from levodopa in your brain. Selegiline and the newer drug rasagiline (Azilect) both inhibit MAO-B (monoamine oxygenase). Stalevo, in addition to levodopa and carbidopa, contains a third active ingredient called entacapone (also available separately as Comtan), which inhibits a second key dopamine-degrading enzyme called COMT. The net effect of either MAO-B or COMT inhibitors is to maintain a higher level of dopamine in your brain for longer. Entacopone. Image credit: Fuse809 at English Wikipedia. Slow down absorption of the drug. A common strategy is to develop “slow release” or “controlled release” formulations of drugs, which basically slow down the rate at which the drug is released from the pill. This doesn’t slow down the rate at which the drug is degraded, but by causing it to be absorbed more slowly, it smoothes out the fluctuations. Controlled release sinemet has been around for a while, but does have some disadvantages. With controlled release formulations, most of the drug passes through the stomach without being absorbed, and gradually gets absorbed in the intestines. But unfortunately levodopa is absorbed best in the stomach, and patient experience suggests that controlled-release sinemet requires higher doses and is associated with more variation in response. It is, however, a great option for night-time doses. The slow absorption in the gut is also a disadvantage when you really need to get a rapid response, e.g., if you are “off” and want to get “on” ASAP. Recently, there has been a new formulation that tries to do both, basically by combining immediate release and controlled release in one pill: Rytary from Impax, approved by the FDA in 2015. 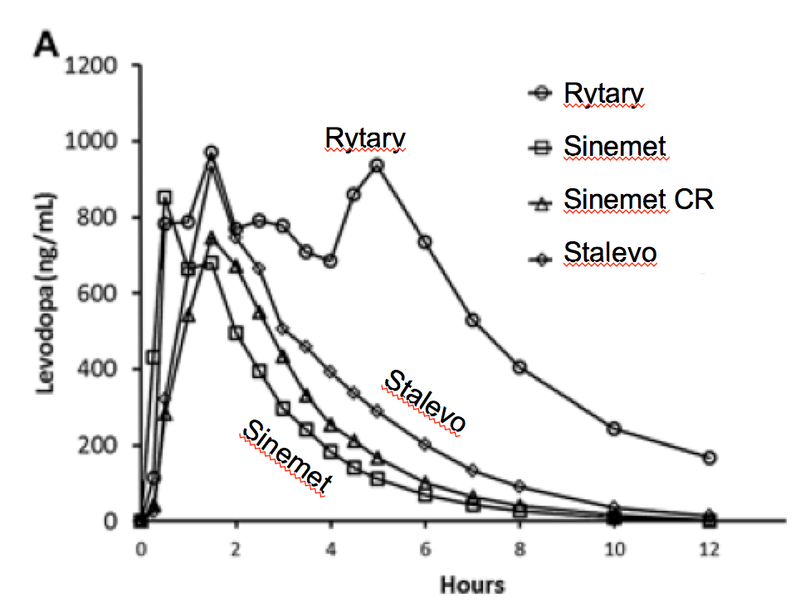 This should allow many patients to achieve more on-time without dyskinesia (about 1 extra hour per day, vs. sinemet, based on the clinical trial), with less frequent dosing, although there may need to be some adjustment of dosages to optimize therapy. There is also a new approach going into Phase 3 testing called the accordion pill. It’s like a little piece of drug-infused ‘fabric’ (actually, a biodegradable polymer) stuffed into a pill capsule; when it gets to your stomach, the capsule dissolves and the fabric unfolds, keeping it in the stomach (where levodopa is absorbed the best) and slowly releasing the drug. Just take it really frequently. OK, that’s not an elegant solution, but it does work. Suppose you are taking 2 sinemet every 4 hours. If you instead take 1 sinemet every 2 hours, the fluctuations in levodopa and dopamine levels will be reduced … a smoother ride. 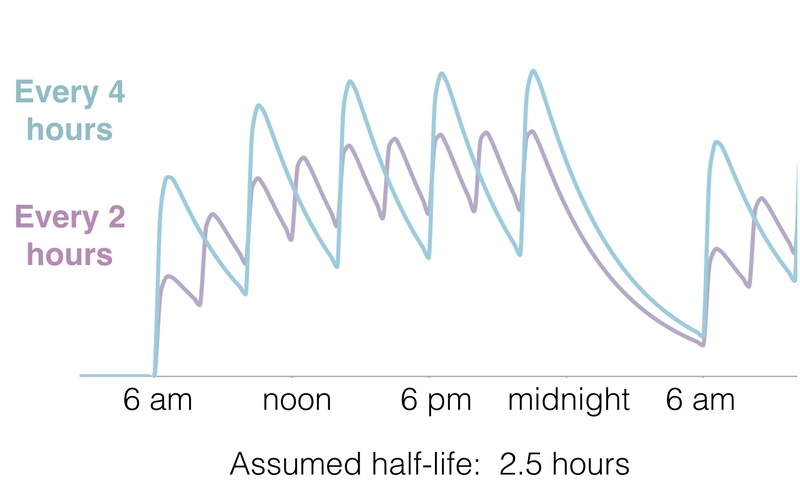 Estimated blood levels of levodopa, when taking doses starting at 6 am and ending at 10 pm. Fluctuations are greatly decreased by taking doses every 2 hours vs. every 4 hours (half the amount twice as frequently). Note the tough start to the day, starting from near zero, if no nighttime doses are taken. The disadvantage is simply that it’s a pain. In principle, you could get even better results by taking a half pill every hour, one quarter pill every half hour … ok, obviously that’s ridiculous. But as a thought experiment, suppose you could divide your pills into very tiny bits and take a micro-dose every minute. That’s basically what duopa does; a little pump delivers tiny amounts, almost continuously. From the standpoint of solving the problem of levodopa’s short half-life, that’s the ideal solution; patients in the clinical trial had about 2 hours more on time without dyskinesias than patients taking sinemet. It does require minor surgery to implant a tube to deliver the drug straight into your gut, and you have to carry around the pump constantly. And it reportedly costs of thousands of dollars a month (although there is a program to provide it at low/no cost to certain patients lacking insurance). But for people with advanced Parkinson’s, with major on-off cycling and dyskinesia, definitely an option to consider. 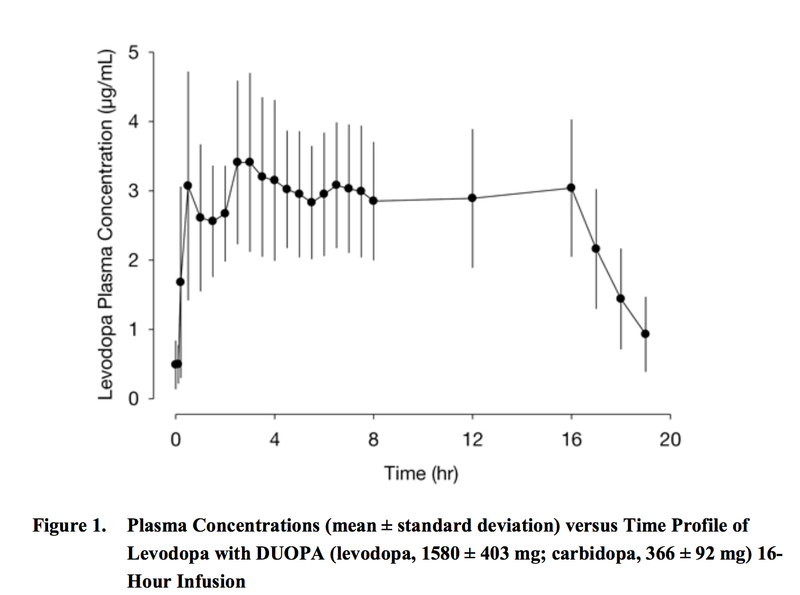 The DUOPA continuous infusion system maintains levodopa levels in the blood with fewer fluctuations than taking pills. From the FDA publication. Note that DUOPA was only approved for daytime use; that may change in the future. Note that, while DUOPA was only approved by the FDA in 2015, the same system (more or less) has been approved in Europe since 2004, under a very slightly different name, DUODOPA. You can find some interesting videos documenting patient experience with the system on Youtube. Rescue dosing. The idea is to develop super-quick-acting formulations of levodopa that patients can use when they start to go “off”, to bridge them until their next pill kicks in. As of 2018, an inhaler for levodopa completed clinical trials, which led to FDA approval in early 2019 (the brand name will be Inbrija).